Born to Sparkle were pumped to be invited to REVERB 2018, the massive three day festival of April. A big old carnival ride came to join the fun, lighting up G.O. Edwards Park gloriously as the sunset every night. 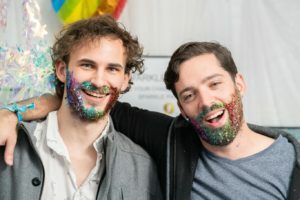 There were so many awesome party people getting their shine on and we had a great time sparkling them up! A group of rowdy boys were keen to be covered in as much glitter as possible, ready for a peacock display that Saturday night. 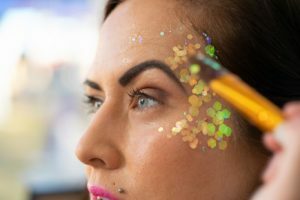 We were happy to oblige, bringing out their eyes with face sparkles and making sure they were highly visible with some cheeky body sparkles. 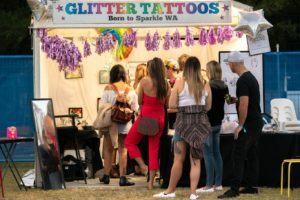 Being fresh from Busselton Pride https://www.borntosparkle.com.au/events/busselton-pride-parade-2018/, we were stocked up on our new 18+ range of glitter tattoos to help them in their quests. The stunner, up-and-comer, young indie musical talent E^ST spotted Mrs Sparkles in the VIP lounge. E^ST rightly identified the Born to Sparkle uniform as amazing and Mrs Sparkles was a little bit starstruck! One of the best parts of bringing the festival glitter to events like this is getting to enjoy the music! 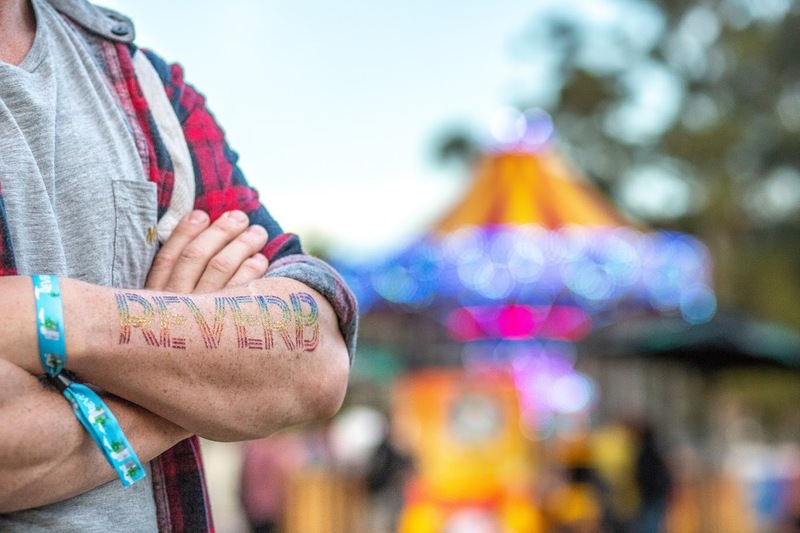 REVERB had two stages – a packed silent disco and a main stage with awesome headliners. Some killer highlights were Xavier Rudd, the Jezebels, the Preatures, Sola Rosa and Cloud Control. When the music was pumping and everyone was crowded around the stage, some of the Sparkle Crew got to grab our bubble wands, run out into the mosh pit and dance like crazy with all the sparkling festivalgoers. Just like her mum met E^ST at REVERB, Mrs Sparkles’ glittery daughter Glitter Glam got to meet her idol, Xavier Rudd. She had a chat to him on Rainbow KINection, Perth’s only queer, indigenous radio show on 100.9fm! Glitter Glam looks forward to meeting Xavier again when he returns to WA in November for his Storm Boy tour.